In the first game (with the skull) you're supposed to throw a tomahawk at a target, and then a buffalo skull, and then a large bowl, and then a pumpkin. There's tipis in the background. The first target is the only one that kind-of makes sense. The others? Nope. Realistically speaking, why would you want to destroy those items?! In the second one (top row, middle), you stand on a hollow log and shoot a bow and arrow across a chasm. Why? Maybe because few things say "Indian" as much as a bow and arrow. In the third one, you "play" a "war drum" by striking your mallet on the drum according to the sequence of dots that scroll across the screen. That music is goofy, too, by the way and sounds nothing like any Native drum I've ever heard. A flute pops in here and there, as does some war whooping. As you play these games, you might get lucky and earn a D.Y.K. (which stands for DID YOU KNOW). In the drum one, the D.Y.K. says "Native Americans believe the drum carries the heartbeat of Mother Earth." For some Native Nations, maybe, but all? I don't think so. Logically speaking, WHERE IS HER OUTER CLOTHING? Maybe there's a storyline about how she got captured by an enemy tribe or some white trappers, but that she got away and is trying to get back to her people. That's snark, by the way... And---the D.Y.K. for this game? "Native Americans used smoke signals to communicate over long distances." Who ARE the people writing this stuff? They ought to be fired. They are hitting all the stereotypes! Missing an apostrophe there, H-Planet! 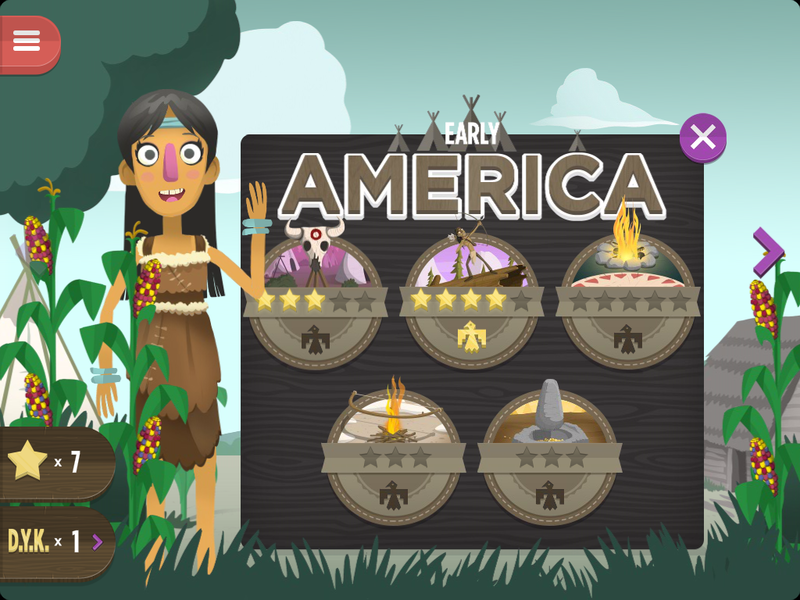 There's one more game in this "Early America" part of the game. Your task is to get kernels off a cob of corn and grind them up to make cornmeal. Let's pause for a word about that phrase, "Early America." 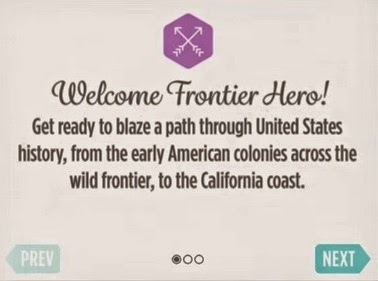 It isn't accurate to call pre-colonial times "Early America." Each Native Nation had its own name for its homelands. America was not one of the names any of them used. At five foot six she was a little short for an FBI agent, but she was lithe and fast, with a delicate oval face and the glossy black hair typical of Native Americans. That "glossy black hair" that is "typical" of Native people? Well.... it is typical of the stereotypical image of Native people. As such, it is our first clue that Colfer's character is, well, a bit more of a white man's Indian than a real Native person. In the story, Riley has time-traveled from 1898, London, to present-day London. He apparently looks at Chevie's glossy black hair and thinks he's landed in a Wild West Show and that she's a "savage Injun." Those Wild West Shows did, in fact, tour England, starting in 1887. But what to make of Chevie saying 'Go figure' to people taking issue with being described as savages? Don't we generally use "go figure" to dismiss something we think is a waste of time? Who, I wonder, is speaking at that point? The character, Chevie? Maybe, but I kind of think 'go figure' is coming from the author himself. Chevie half-smiled. 'Shawnee, if you have a burning need to know. I'm a bit puzzled by Riley thinking Chevie was Apache. In the Buffalo Bill shows, the Indians were Lakota. There's a lot to say about that paragraph. What "Shawnee reservation" is Chevie talking about? There are three federally recognized Shawnee tribal nations in Oklahoma: the Eastern Shawnee Tribe of Oklahoma, the Shawnee Tribe, and, the Absentee Shawnee Tribe. That said, "reservation" gives me pause, too. Chevie is 16. Doing some math based on the publication year for The Reluctant Assassin, I think we'd be in the 1960s or 1970s when Chevie's parents were growing up. But, tribes in Oklahoma went through allotment. Their reservations ceased to exist as reservations in the late 1800s. What, I wonder, is Chevie/Colfer talking about when he says "reservation"? But, Chevie tells us, they don't call it that anymore. Now, they call it "trust land." Colfer is taking us into federal law that is hard to understand. I like that he's trying, but it muddies things up more than is helpful. Before allotment, the Shawnee Tribe had been incorporated into the Cherokee Nation, but had maintained their identity as Shawnees. In 2000, the U.S. Congress, working with the Cherokee Nation and the Shawnee Tribe, restored the Shawnee Nation to its status as a distinct entity. The document about it includes "trust land" and "trust responsibility" in it, and I suspect that is where Colfer got "trust land" from. It doesn't ring true for me to hear Chevie say that they call it trust land now, but I'll ask friends who are Shawnee and see what they say. Why does Chevie expresses disbelief that a Native American would get killed by a bear on a camping trip? Is it because Native people are supposed to be one-with-the-animals? Or, because Native people would know how to defend themselves from animals in the wild? Either one is a stereotypical framework. Chevie's dad drinks. Is that a drunken Indian stereotype? Or just a grieving husband like many who turn to alcohol to self-medicate? My hope is that Colfer had the latter one in mind, but to a Native reader, the first one stands out as that drunken Indian stereotype. I think The Reluctant Assassin is the kind of story people clamor for. By that, I mean the people who want diversity but don't want that diversity not to be a factor in the story. 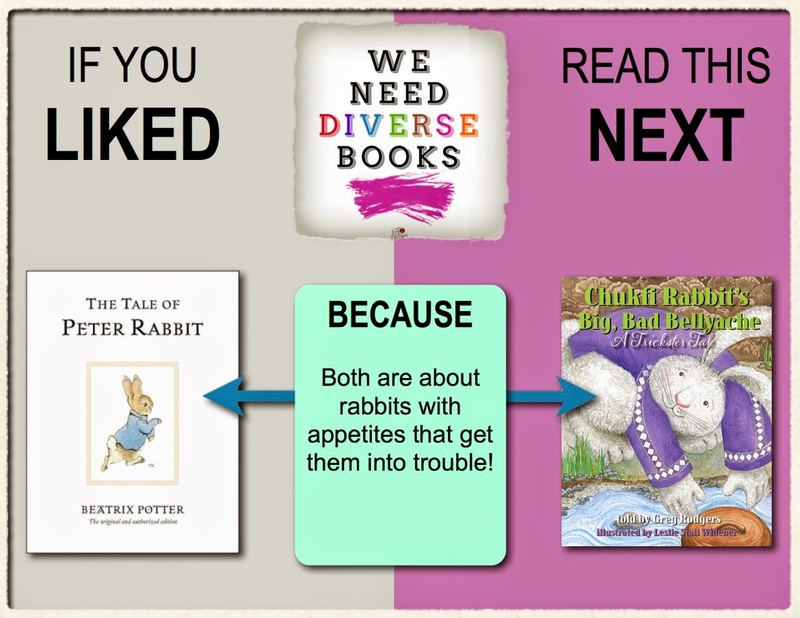 A story where the characters are racially diverse, but that the story isn't about racial issues. I understand that desire, but it makes me bristle. Imagine a conversation where a white mother is sitting with me, a Native mother, and the white mother is saying, without saying, "I don't want to know about what the Catholics did to the pueblos, and, I don't want to hear about the pueblos fights for their water rights, either. Just be my friend." Am I being reductive? Unfair? Maybe. It would be cool for a Shawnee kid to read a story like The Reluctant Assassin, IF the Shawnee parts were accurate. When stereotypes are there instead, though, it kind of ruins the magic for that Shawnee reader, or for any reader who knows a bit about Shawnees or Native peoples. Its kind of like Colfer didn't imagine that a Shawnee kid might read this book. I'm sure Colfer meant well. Writers do. But I think their work would be even better if they had Native readers in mind, too, when they created their stories and characters. The Relucant Assassin is not that story. Chevie's name... there's a story behind it. This is at the end of the book. "No. And I based my whole life on that story, got the tattoo, told anyone who would listen, became an agent. Last year I meet the Texaco guy, who is broken up that my pop died, and he tells me the truth. I am named after a gas station." That is a kick in the gut. In pop culture, people have a grand time fooling around with Native names. It is perverse to see it in this story, coming from a character that is supposed to be Native. Definitely not recommending The Reluctant Assassin. Choctaw writer and storyteller, Greg Rodgers, passed away last night. Just a few days ago, I listed Chukfi as one of AICL's Best Books of 2014. Greg was a new voice in children's literature. I looked forward to what else he'd be giving us. 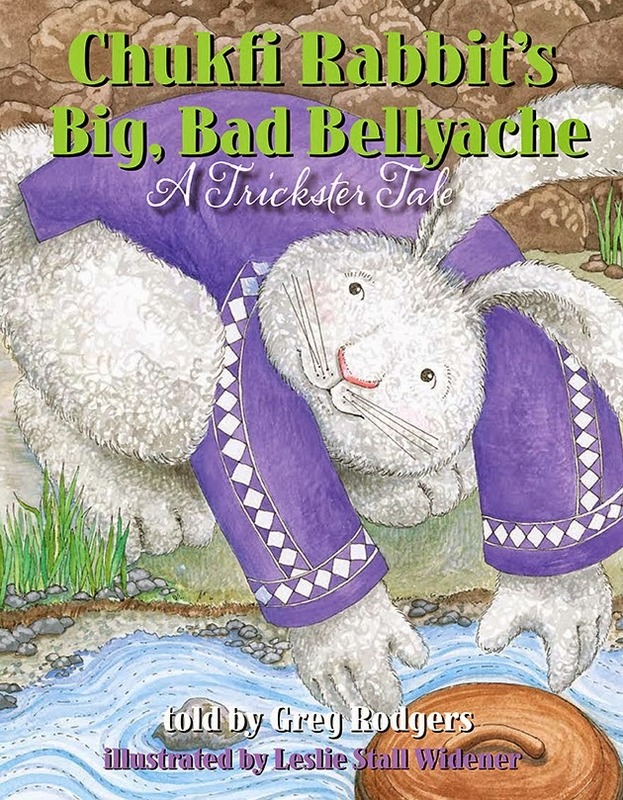 As a writer Greg Rodgers authored three books, “The Ghost of Mingo Creek and Other Spooky Oklahoma Legends,” “One Dark Night in Oklahoma,” and the highly popular children’s book, “Chukfi Rabbit’s Big, Bad Bellyache,” plus dozens of yet-to-be-published stories. Over the holidays Greg intended to focus on his upcoming novel, a powerful and difficult piece of Choctaw historical fiction, the story of Hotema, a protestant preacher who died in prison. As an oral performer Greg was a quiet genius, ushering the audience down a path of faith and fear and always ending in triumph of the good. Those fortunate enough to have seen him perform his Trail of Tears story, “Harriet’s Burden,” will never forget the experience. A tragic tale of heinous cruelty concludes with a depth of Choctaw spirituality rarely seen onstage. With a mark of Choctaw humility, Greg was much more proud of his teachers than his own accomplishments. Among his favorite instructors were Joy Harjo, N. Scott Momaday, Geary and Barbara Hobson, LeAnne Howe, Clara Sue Kidwell, and Rilla Askew, a Who’s Who of American Indian authors. Greg recently created a term, a “brand” which he hoped to promote: The Choctaw Literary Renaissance. He planned to discuss the emergence of contemporary Choctaw writers at a series of conference panels and discussions in the Spring of 2015. We already miss you more than you will ever know, Brother Greg. Too soon, you left us staggering far too soon. But we forgive you, on the sole condition that you work your magic through the fingers of young Choctaw writers, doing their best to continue your work. You are family to thousands of Choctaws, and Nahullos, too. My thoughts are with those who knew Greg personally, who worked with, and cared for him. 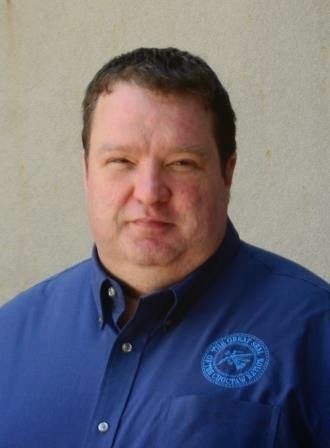 "Greg Rodgers wields the right words to perk listeners ears" in Biskinik, the Choctaw Nation's newspaper. Date: March 23, 2011. 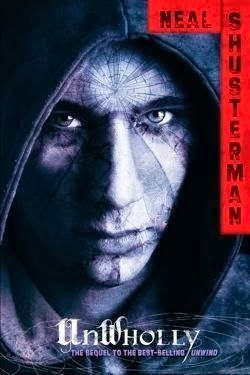 On September 25, 2014, I uploaded my review of Shusterman's short story, UnStrung. It is part of his UnWind Dystology, set in the future, after a civil war. In UnStrung (published in 2012), most of the action takes place on an unnamed "Hi Rez" reservation. "ChanceFolk" live there. They are rich, as opposed to "Low Rez" tribes that didn't spend/invest their money well. We learn that Indigenous peoples are called ChanceFolk instead of Indians and that some people call them SlotMongers (yes, that is seen as a slur). The civil war was fought over abortion. The outcome was that abortion was replaced by "unwinding" -- a process by which parents can, at age 13, send their unwanted kids away to be unwound. That means that 99.44 percent of their body parts will be used as transplants. They will, of course, cease to exist, but somehow, they are said to be alive in a "divided state" due to that transplanting of their body parts. In addition to unwanted 13-year-olds being unwound, some couples choose to conceive and birth a child that is a tithe. At age 13, they, too, will sent to be unwound, but everyone see their lives and unwinding as a blessing and sacrifice for their specific religious group. 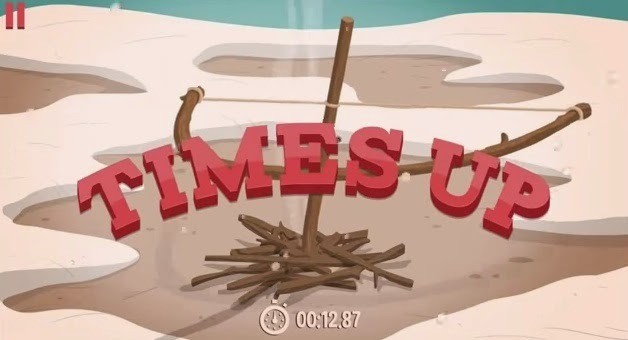 This unwinding takes place at Harvest Camps (pretty disgusting premise, eh?). In addition to this government sanctioned unwinding, there are "parts pirates" who sell body parts on a black market. Below is my brief synopsis of UnWind, key points in UnStrung, and a more detailed review of UnWholly and UnSouled. The fourth book, UnDivided, is not part of this blog post. We're introduced to Lev in UnWind, the first book of this series. He was conceived by his parents on purpose as a tithe who will be unwound when he is 13. On the way to the harvest camp, he is kidnapped by an older kid named Connor who is determined to un-do all this unwinding stuff, but things don't go as planned and Lev ends up becoming a clapper. Clappers are kids whose blood is infused with chemicals so that loud clapping will cause them to explode. As UnWind draws to a close, Lev is supposed to clap, thereby detonating himself at a harvest camp, but he chooses not to do that. Instead, he pulls people to safety and will, later, need to have his blood cleansed. When UnStrung opens, we find Lev at a reservation. He sought refuge at this reservation because he'd heard that ChanceFolk didn't sign the Unwind Accord. Rather than use human body parts, their scientists have perfected a way to use animal parts instead, but the parts have to be from their particular spirit animal. They find out their spirit animal on a vision quest. At this unamed rez, Lev is nursed back to health by a Native doctor. She and her lawyer-husband have a son named Wil (he's older than Lev) who has a special musical gift. They call Lev "Mahpee" which means "sky faller" and is the name they use for people who climb the rez wall and drop down, into the reservation. When Lev is feeling better, he and Wil are out with a group of kids on a vision quests to learn what their spirit animals are. But, they are attacked by some parts pirates, who want Native people because their parts are much desired. Wil sacrifices himself for the group. The story ends with his family and the tribe making Lev leave (Wil's family had tried to get sanctuary for Lev, but the tribal council said no to their request), and, they don't know what has happened to Wil. They know he was taken by parts pirates, but they don't know if he was unwound. There's lot of stereotyping of Native peoples in UnStrung. Read my review for details on that, and see what Shusterman said in response. That face is a nightmare. Strips of flesh, all different shades, like a living quilt stretched across the bone, muscle and cartilage beneath. Even his head--clean-shaven when he awoke, but no filling in with peach-fuzz hair--has different colors and textures sprouting like uneven fields of clashing crops. They are not as random as he had thought. They are symmetrical, the different skin tones forming a pattern. A design. "It was a choice we made to give you a piece of every ethnicity. From the palest sienna-Caucasian, to the darkest umber tones of unspoiled Africa, and everything in between. Hispanic, Asian, Islander, Native, Australoid, Indian, Semitic--a glorious mosaic of humanity! You are everyman, Cam, and the truth of it is evident in your face." Roberta goes on about how the scars will heal and he'll be "the new definition of handsome" and "a shining beacon" that will be "the greatest hope for the human race." Frankly, I find this very unsettling. It means, of course, that faces were cut up to make his. And goodness! The stereotyping in it: "unspoiled Africa"?! As opposed to what? Spoiled Africa? Spoiled, how?! Cam is unsettled by it all, too. At an event designed to show him off to VIPs, he malfunctions, calling out "I am more than the parts I'm made of!" (p. 144) He tries, unsuccessfully, to call that line out again and again but the words don't come. The big moment is ruined and Roberta whisks him off stage. He thinks back to the days after he left CyFi, and before he arrived at the Graveyard. Dark days, to be sure, but punctuated by a bit of light when he found himself on a reservation, taken in by People of Chance. The Chance folk had taught him that when you have nothing to lose, there's no such thing as a bad roll of the dice." "Mr. Cavenaugh, the natives are getting restless. Can I let them in?" Now see... I bet most people (like Shusterman and his editor) didn't give that phrase a thought! But if you're reading (as I am) through the lens of people who are dehumanized by white writers, well, FACEPALM. Lev stays at that mansion for awhile but by the end of the book, he's reunited with Connor. ...the young man with multiple skin tones that are exotic yet pleasing to the eye. Exotic and pleasing to... whose eye? This is the white fascination with 'other' taken to an extreme. I don't like it. As readers, I think Shusterman doesn't want us to like it either, but I'm not sure it works. Is there enough in the narrative that tells the reader that this gaze is problematic? If you see this taken up in a review, please let me know in the comments. The companion that Cam ends up with is Risa. She's been a major character ever since Book 1. She was/is in love with Connor (also from Book 1) and doesn't like being manipulated into being Cam's companion for a public relations tour. Previously, she was in a wheelchair but Roberta gets her a new spine so she can walk. Then, there's a creepy thing that happens, and it appears later, too: the part of Cam that knows algebra is from a kid who had a crush on Risa. Cam has that memory--of the kid having a crush on her. When he tells her, she is horrified. Eventually the two slip into a friendly relationship and Roberta is thrilled with their interviews. But! At the end of the book at the last interview, Risa says its all been a farce. She takes off; Lev and Connor are headed east to Akron, on Route 66, to find a woman named Sonia. "Get me to the Arapache Rez. West of Pueblo, Colorado." Connor knows Lev must be delirious. "A ChanceFolk reservation? Why would ChanceFolk have anything to do with us?" "Sanctuary," Lev hisses. "ChanceFolk never signed the Unwind Accord. The Arapache don't have an extradition treaty. They give asylum to AWOL Unwinds. Sometimes." "Asylum is right!" says Grace. "No way I'm going to a Slot-Monger rez!" In spite of all the literature and spin put forth by the Tribal Council, there is nothing noble about being a sentry at an Arapache Reservation gate. Once upon a time, when the United States was just a band of misfit colonies, and long before there were fences and walls marking off Arapache land, things were different. Back then, to be a perimeter scout was to be a warrior. Now all it means is standing in a booth in a blue uniform, checking passports and papers and saying hiisi' honobe, which roughly translates to "Have a beautiful day," proving that the Arapache are not immune to the banality of modern society. Ah, shucks. This poor sentry. He isn't liking his job. He's rather be a noble warrior, scouting the perimeter of their land (Stereotype! Noble stereotype!). And here we go with some more made up language! I saw that in the short story, too. And remember that Mel Gibson did it, too, for Apocalypto? Here's more from the rez gate (p. 73). At thirty-eight, the rez sentry is the oldest of the three on duty today at the east gate, and so, by his seniority, he's the only one allowed to carry a weapon. However, his pistol is nowhere near as elegant and meaningful as the weapons of old, in those times when they were called Indians rather than ChanceFolk... or "Slot Mongers," that hideous slur put upon them by the very people who made casino gaming the only way tribes could earn back their self-reliance, self-respect, and the fortunes leeched from them over the centuries. Although the casinos are long gone, the names remain. "ChanceFolk" is their badge of honor. "SlotMongers" is their scar. I get that Shusterman is trying to tell readers that colonization was a bad thing for Native peoples, but that message goes hand in hand with stereotyping... That poor sentry, wistful for being able to carry a "weapon of old" ---what might that be?! A bow and arrow? Or... a spear?! Those weapons of old have more "meaning." But why?! What gives a weapon meaning? I don't get it. Not every tribe has taken such an isolationist approach, of course, but then, not many tribes have been as successful as the Arapache when it came to creating a thriving, self-sustaining, and admittedly affluent community. Theirs is a "Hi-Rez," both admired and resented by certain "Low-Rez" tribes who squandered those casino earnings rather than investing in their own future. As for the gates, they didn't go up until after the Unwind Accord. Like other tribes, the Arapache refused to accept the legality of unwinding--just as they had refused to be a part of the Heartland War. "Swiss Cheese Natives," detractors of the time had called them, for the ChanceFolk lands were holes of neutrality in the midst of a battling nation. So the rest of the country, and much of the world, took to recycling the kids it didn't want or need, and the Arapache Nation, along with all the rest of the American Tribal Congress, proclaimed, if not their independence, then their recalcitrance. They would not follow the law of the land as it stood, and if pressed, the entire Tribal Congress would secede from the union, truly making Swiss cheese of the United States. With one costly civil war just ending, Washington was wise to just let it be. Of course, court battles have been raging for years as to whether or not the Arapache Nation has the right to demand passports to enter their territory, but the tribe as become very adept at doing the legal dance. The sentry doubts the issue will ever be resolved. At least not in his lifetime. This passport stuff is, for some current tribal nations, real. The Onondaga Nation issues passports. Prior to 9/11, they were accepted at international borders, but heightened security put a stop to that, preventing the Iroquois national lacrosse team from an international competition. I guess Shusterman read up on that, a bit. "The medicine woman?" There are many thousands on the rez, but there are those whose reputation is well known. The Tashi'ne family is very highly regarded--and everyone knows about the terrible tragedy they endured. As for Lev, he was infamous on the rez before he became "the clapper who wouldn't clap." You can't speak the name of poor Wil Tashi'ne without also thinking of Lev Calder and his involvement in that tragedy. And his friends here probably don't even know. "We built America's great bridges and skyscrapers," Wil had told him proudly. "For us, balance is a matter of pride." With that, Shusterman is referencing a fact, but giving that identity to his made-up tribe. Shusterman's tribe is in Colorado. The real ironworkers? Mohawks. As I said in my review of UnStrung, I think Shusterman had Pueblo Indians in his head as he created this tribe. Pueblo peoples used ladders at Mesa Verde and similar places, but in the modern day, we didn't do the ironwork that Mohawk's did. This cut/paste of identity is what makes the fictitious tribe move Shusterman did problematic. Recall from UnStrung, the ChanceFolk have spirit animals that they use for their replacement body parts when they need parts? Well... guess what? Lev is able to get a spirit animal, too. On page 158, he figures out that his spirit animal is a kinajou. They live in the tropical rain forests of Southern Mexico and Brazil. The "spirit animal" stuff... that's not real either. It is another thing that outsiders to Native tribes use all the time. With one hand they rebuke creature comforts, but with the other they embrace it--as if they are in a never-ending battle between spiritualism and materialism. It must have been going on so long, they seem blind to their own ambivalence, as if it's just become a part of their culture. I want to think through this for awhile, but for now, I'll say this: this kind of judgement of Native nations that have casinos is common. A good bit of it is from people who think that Native peoples are "better" than other human beings and disappointed with casinos and what tribes do/do not do with profits from those casinos. It is the "noble savage" who is akin to the "model minority"--- but who disappoints the gaze because... we're human! There's some strategizing happening, over Connor and Lev and what they'll do next. They want to leave but they'll need to throw the media off their tracks in some way. The plan? Bring in another tribe. But this time, it is a real one: the Hopi. Elina's husband, Chal, is a lawyer and he'll put the word out that he's going to represent the Hopi in a land dispute case, and that in return, they will give Connor and Lev asylum. Up to this point in the book, I've read (re-read, actually)--but not commented on--the chapters told from Cam's point of view because they've not been specific to Native aspects of who he is, or about the Chance Folk either, but that returns on page 214. Cam signs his name on a document Roberta gives him. But then she asks him to flip the paper over, look at her, and sign his name again as he looks at her. He does, and when he looks back at the paper, he sees Wil Tashi'ne's name rather than Camus Comprix. Why? "It's his neural connections and muscle memory that allow you to play guitar and accomplish a whole host of fine-motor skills." As you might suspect, Cam is taken aback by this development, making him wonder who he is. This muscular memory is going to appear later, again. At this point, Cam is definitely in love with Risa, misses her, wants to find her, and thinks he can impress her by bringing down Roberta and her company. She was/is in love with Connor, and of course, Cam is jealous but thinks that Connor is dead. He's feeling conflicted over a lot of things (like being treated as property) and starts wandering around alone. Roberta doesn't like him doing that. After one outing, Cam goes to his room and starts playing the guitar. Remember--it is Wil's hands and muscle memory that drives his playing. Earlier, he'd learned that Connor wasn't, in fact, dead. As he plays the guitar, fragments of memory come together and he recognizes Lev, via Wil's memories, as someone who he (Wil) had healed with his music. He plays more and pulls together a much more complete memory of Lev. He figures he's got to get to the When he'd been out earlier that evening and saw that Connor was in the news, he also saw the photo of Lev, and as he plays the guitar, he digs till he finds a memory of Wil playing for Lev on the Arapache reservation. He figures that's where Risa is and takes off to find her. On page 252, he's found her, on the reservation. He's gotten past the gates, Wil's memories guide him to Una's house. We met Una in UnStrung. She was Wil's girlfriend. Cam finds that his hands know just where she keeps a key, hidden, and uses it to go in her house. He finds one of Wil's guitars and starts playing it. Of course, Una hears the music, goes to investigate and sees Cam. She listens to him play for awhile, and then knocks him out with a guitar, ties him up, and carries him to an old sweat lodge where youth went to do a vision quest when they were of age. A vision quest. Safe to say all of this is another face palm. Both are common in books outsiders write about Native peoples. Both, a sweat lodge and a vision quest, are specific to certain tribes--not all of them--but they get put forth as one of those "Indian" things that has to be in ANY book ANYONE writes about Native people. In that lodge, she ties him up between two poles that are six feet apart. The description of its size makes me wonder what Shusterman is talking about. I don't think a sweat lodge is big like this one, and they aren't made of stone. I'm thinking Shusterman is thinking about a kiva. Remember--the "Arapache" village is Puebloan in style. We use kivas, and some are made of stone. And they're big. Anyway! Moving on. Cam stays unconscious as she ties him up between those two poles. He slumps, and looks like "a supplicant Y" (p. 256). Una leaves for the night, and returns the next morning..... with..... a chain saw. "Up and down and around--those lines go everywhere, don't they? Like an old shaman's sand drawings." "The shaman's lines are meant to trace life and creation--is that what your lines are for too? Are you a creation? Are you alive?" "Are you that man-made man I've heard tell of? What is it they call you? "Sham Complete'?" Una does not like Cam. So what does this rez girl plan to do? She knows he has Wil's hands, so, she's going to cut them off with that chain saw! At the last minute, she cuts his jacket (that's what she used to tie one of his arms with) and hurls the chain saw across the room ('room' doesn't work if this is really a sweat lodge). With that free arm, he reaches up and unties the ribbon in her hair. She backs away, freaked out by that because that was something that Wil used to do. He tells her about memories he has via Wil's parts, now his. Then she cuts his other arm free and asks him to show her (with his hands) what Wil's hands would do to her. He touches her neck, her lips, her cheek, wrist... and then, she knocks him out again. And ties him back up. Pretty intense scene, isn't it? And creepy. Very creepy and unsettling, too. It is violent, and it is a violation. It is perverse. On page 270, Connor (he, Lev, and Grace are staying with Una) becomes suspicious of why/where she goes each day with a guitar and rifle. He decides to follow her to a structure he says is shaped like an igloo. Connor climbs on top of it, peering down as Una repeatedly asks Cam what her name is. He can't remember. They've been having this 'what's my name' conversation for a few days already. Connor can see that Cam has been urinating in his pants. He smells horrible. Her interrogation of him over, she unties him and at gunpoint, makes him play the guitar. That, and the previous scene, are ones of torture. Una is torturing Cam. It is sadistic. While there have been sadistic acts throughout Shusterman's series, especially with regard to the creation of Cam, Shusterman has never been this graphic. I wonder if he sees that he saved up the most grotesque behaviors for the Native character? Does he see that he's created the savage Indian? From his perch atop the lodge, Connor knocks some stones loose. Una sees him, aims her rifle at him, he falls down, she runs out with her rifle, points it at him... and then Cam bolts. She runs after him, dropping her rifle to tackle him, and Connor picks it up. Now he's in charge. He tells Cam that Risa is not there. Una wants to tie him up again but Connor insists on taking him back to her apartment. With the rifle, he's got control of the situation. Back at Una's, they see a press conference at which a spokesman for the Hopi tribe will neither confirm or deny a rumor that Connor and Lev are on their reservation. This creates the distraction that Lev and Connor need to take off. Elina arranges a car. But, we learn that Lev doesn't want to go with Connor because he thinks he can "make a difference" (p. 317) because "they need to start listening to outside voices" (p. 318) and he can be that voice. The tribe has provided them with IDs. Both are now Arapache. Lev's name is Mahpee Kinkajou, and Connor's is Bees-Neb Hebiite Elina says Connor's name means stolen shark (he has a shark tattoo on the arm that used to belong to someone else). Connor and Grace leave, taking Cam with them. Recall that in UnStrung, Lev's outsider status meant more to Wil's grandfather than Wil's perspective did? This is another slice of that, and it bothers me. Shusterman is making sure we all know that Lev is a white savior. He knows best. Life for Lev, on the Arapache Rez, is peaceful and calm, but he feels compelled to do something about what is going on outside. He talks with Elina, but he finds that she has a "passive, fatalistic view of the world" that "too many people on the rez share" (p. 347). I find that "fatalistic view" to be much like the stereotype of primitive Indians with no agency, just living life. No worries, no cares, like children. There's an expression among ChanceFolk. "As go the Arapache, so go the nations." As the most financially successful, and arguably the most politically important ChanceFolk tribe, policy that's put in place here often spreads to other tribes. While the Arapache are still the most isolationist, instituting borders that require passports, many other tribes--particularly the ones that don't rely on tourism--have made their territory harder to access as well, taking their lead from the Arapache. His question is greeted by silence. He repeats it, and then hears a response, also in Arapache. It is Una saying she will help him. Slowly the crowd starts to clap for Lev and his plan, and that's the end of the Native parts of UnSouled. Shusterman's fourth book, UnDivided, will have its own blog post. Thus far, I've found the series unsettling. I know--that's what a dystopia is supposed to do--but the use of stereotypes and the mishmash of elements of various tribes--mean the book doesn't work for me as a Native reader. There's too much wrong. In his comment to my review of UnStrung, Shusterman said he worked hard not to stereotype, but that he didn't want to be "politically correct" either, because that is as bad as stereotyping. What, I wonder, would this series have looked like if he'd been "politically correct" in his treatment of Native culture and characters? When my daughter was in college, one of the elective courses she took was about birds. It contrasted with the readings she was doing in philosophy and history. For years we'd talked about philosophy and history. Talking about birds, however, was new. She learned a lot of fascinating information that she passed on to me. See that gorgeous art? That's one of the strong points of this nonfiction book, but so are the facts provided about birds. The information provided for each of the twelve birds is shared in these categories: Where to Look, What they Eat, Listen for, Nest, Egg, Chick, and During the Winter. 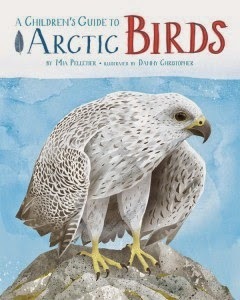 Very useful for people in the arctic, but useful, too, for kids who are doing bird studies anywhere. And the endcovers! Gorgeous! One in the front depicts eggs for each of the birds inside, and, the one in the back shows them, in scale, flying in silhouette. The twelve, from smallest to largest are: snow bunting, red phalarope, rock ptarmigan, thick-billed murre, arctic tern, long-tailed duck, common eider, red-throated loon, gyrfalcon, snowy owl, raven, and, tundra swan. In addition to double-paged spreads about each bird, there are stand-alone pages about feathers, bills, and feet. I love seeing Native languages in children's books! 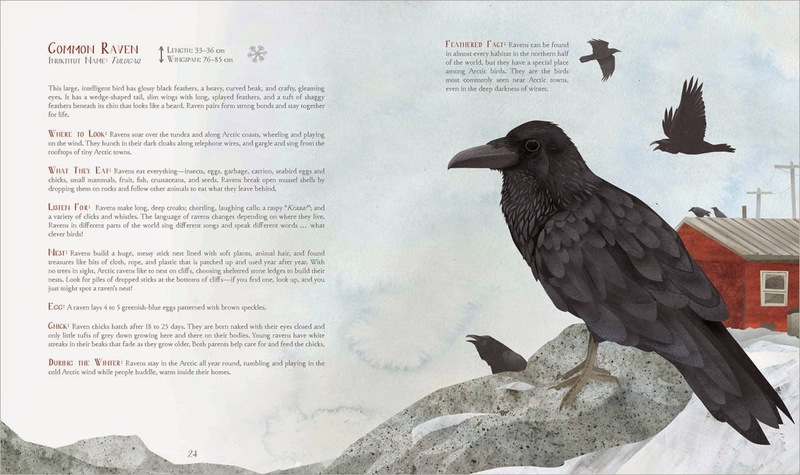 I would have liked to see another category that addresses how the bird is viewed amongst the Inuit people, or a stand-alone page about the language and people, but I do like and recommend A Children's Guide to Arctic Birds. It is a 2014 nonfiction title from Inhabit Media. Pelletier and Christopher are not Native.